Thank you Johnsonville for bringing out loose-form Italian Sausage meat! I don’t know about you… but I always detested having to take the sausage meat out of the casings. Here’s a quickie 5-minute meal, and my quickly written blog post. I had defrosted this spicy sausage meat last night, and used about half of it on our homemade pizza. It added just the right zing! However, I was left with about half a package to cook up today along with some thinly sliced onions. Now… what to make for lunch? I was inspired to create a twist on one of my favourite, childhood lunches – Sloppy Joes. Typically, I use ground beef and Heinz’s Chili Sauce to make mine on toasted buns. But today… I tried something different. 1. Place meat in fry pan, and use your potato masher to break it up. 2. Add the sliced onions, and fry together with a squeeze of Sriracha and Worcestershire Sauce. 3. Slather Toasted Garlic and Horseradish Dip on the buns. A new find while traveling last summer from Robert Rothschild Farm. 4. Top the buns with the cooked meat and onion mixture, and feta (mine was homemade – salty-goodness). 5. Serve with a side of dill pickles. I like to crinkle-cut mine! Best thing I ever bought at Ikea – a veggie crinkle cutter. How do you make your Sloppy Joes? Please feel free to share in the comments section below. check out my instructor’s easy-to-follow RECIPES. For lunch a couple of days ago, I pulled this soup out of my freezer for a quickie meal with a girlfriend who was dropping by, just in case she needed some sustenance on her Errand-Running Day. But it ended up being LunchFor1, and I had a blessed bowl of comfort after a busy, and somewhat stressful, morning. 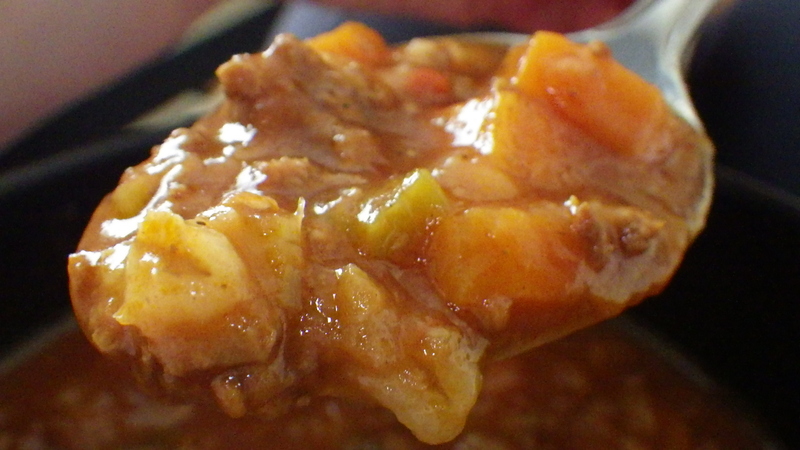 This recipe makes a nice, hearty soup that is perfect for enjoying with a big group, or to make ahead and freeze for future use. This was my #1 Choice as the go-to soup that my husband and I made a couple months ago in the days following my surgery. And it froze so wonderfully! It’s been such a chilly week here in the middle of Canada, but it’s supposed to warm up for the weekend – YEAH! I first had this soup about 30 years ago, and you’d think because I can remember exactly who made, when, and why, that I would have been making it every Winter for the past 30 years – NOPE. I only recently tracked it down again thanks to an old friend of mine (Thanks Shelley). And now that I’ve adapted it, I would like to share it with you, because it’s also inspiring my newly created blog – LunchFor1.com. Follow me on Twitter @LunchFor1 for easy meals that are good eats any time of the day! There I was a 10-year old figure skater on test day, both nervous and hungry, and in need of a little, quick comfort. The nice lady at the rink’s canteen, Eleanor, had made a batch of Homemade Hamburger Soup for all of the hungry, little tikes to eat while we waited our turn before the judges. All these years later, I still remember the heartiness and the smoothness of this soup, as well as the yummy chewiness of the barley. The key to this soup is spending the time to cut the veggies up into a fairly small pieces – 1/4″ to 1/2″ dice. The soup was a like a hug, and it’s stuck with my taste buds for these past three decades! It’s a smart idea, at this or any time of the year, to keep a few Roasted Garlic heads in your fridge for these “lunch emergencies”. It was super easy for me to pull out the pre-roasted garlic head from the fridge, pop the cloves out, and quickly mash them up in order to dress up my lunch selection with an upscale spread. This Roasted Garlic Spread is better than butter, and much healthier too! From time-to-time, when you’ve got the oven roasting something, simply take a whole head of garlic, chop off the top portion, and place it on a piece of tin foil. Then I pour 1 teaspoon of Olive Oil on the garlic, add a pinch of sea salt, and grind some fresh pepper over it. Then I wrap it up in the tin-foil, and set it in the oven to roast for about 45 minutes. Then let it cool and slide it (tin foil and all) into a storage baggie, and place it at the back of your fridge for future use. Or, for creating a big-batch of Roasted Garlic check out my Stove-Top Roasted Garlic post from March 2012. 1. Boil water in a small pot. Add 1/2 tsp. salt, and 1/2 cup Pot Barley. Cook for 30 minutes. Drain and add to soup. do not get overly thick from the barley’s starch. 2. Dice all the vegetables. it becomes very fine – it’s much faster and easier that way. 3. Brown the beef, onions and garlic in large stock pot. 4. Add the liquids and tomatoes, and bring it all to boil. 5. Add all of the vegetables, and spices. 6. Cook for another 1/2 hour (or more), and serve with Mashed Roasted Garlic Spread and fresh buns. and freeze some for an easy lunch on another chilly day! What is your favourite soup to use for comfort on a cold day? Please feel free to share your comments below. Taking an old favourite ‘upscale’ with a fancied-up dinner roll. This soup isn’t your ‘cup of tea’? Check out the other soup ideas that I’ve Pinned on Pinterest. Watch for my next post on Homemade Chevre Cheese! It takes SO little to make your own Chevre cheese at home. An expensive indulgence for much less than you would think! Today is a very cold day in Winnipeg (woke up to -18*C). I was a “nice wife” and let my dear hubby take the car downtown to his office instead of taking the bus in the brrrr temps. So it was time to get creative for Lunch for One. Plus, I wanted to feel like I’d escaped the land-locked centre of Canada by pretending I was eating Peel&Eat Shrimp down on the warm Gulf of Mexico. Firstly, there was no way I wanted to peel all a pound of 70/90 count shrimp before I cooked them, thus the need for an easier solution. I was also still hungry after my usual morning bowl of Cheerios, so I knew that I needed to bump up my protein intake today. Bacon was my 1st protein choice… but I’m trying to eat healthier, and to “release” some of the post-surgery weight I’ve gained. So a good ol’ fashioned shrimp boil seemed like a perfect choice! NOTE: Double the spices if you use three or more pounds of shrimp for a party. 1. Bring the water to a boil in a small pot, with the spices. Add shrimp and cook for 90 seconds. 2. Drain in strainer. 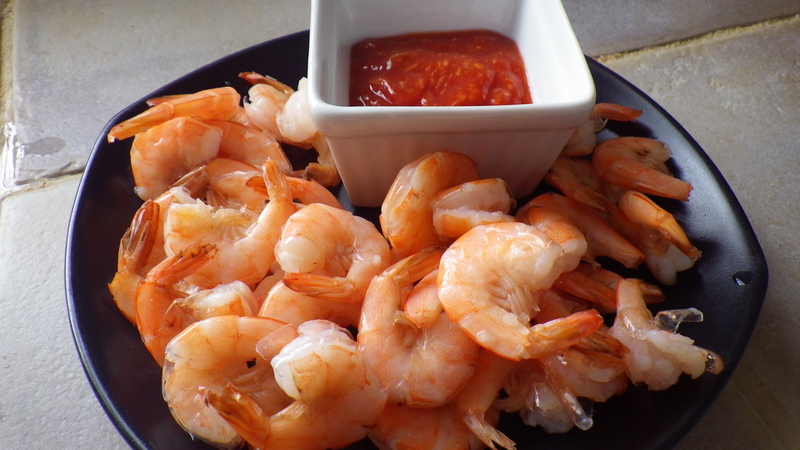 Place shrimp in an ice bath. Drain shrimp. Pick out shrimp from spices and ice cubes. 3. Serve with a store-bought tangy cocktail sauce, and enjoy! You’ll never want to buy pre-cooked shrimp again. TIP: If you are doing large quantities for a party, I’d suggest finding yourself some cheesecloth and tying up the spices in a spice bag for a quicker cleanup. Here’s a link to My Recipe TV’s Youtube video on How to Make a Spice Bag. Please let me know how you experimented with this recipe, and/or how you boil shrimp – wherever you may be.